The Rider’s and Volunteer’s in Cochrane for the BBQ and Prizes! Thank you! 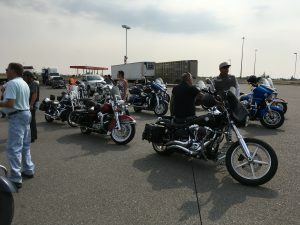 MADD Calgary hosted our 16th Annual Awareness Poker Run in the spirit of our mission! It was a beautiful day that consisted of a many fellow riders, a great ride, a delicious BBQ, and ended with many wonderful prizes! The turnout of registrants and participants this year was great! With event’s like this, we are able to create the awareness that MADD needs. Thank you to all our wonderful volunteers who put their time into the success of this event! It may not be easy, but it was sure worth it! Our Volunteers at Registration in Shawnessy. Tracy Franklin speaking to the Riders!